Thirty numbered pockets for tips, eight additional unnumbered Four unnumbered pockets for cords Zip pocket for connectors and tools US Numbers: 2, 3, 4, 5, 6, 7, 8, 9, 10, 10.5, 10.75, 11, 13, 15, 17 Metric Numbers: 2.75, 3.25, 3.5, 3.75, 4, 4.5, 5, 5.5, 6, 6.5, 7, 8, 9, 10, 12 Closed: 4" w x 7.25" h Open: 14.5" x 14.5" Poly-Silk Now in Stripes! 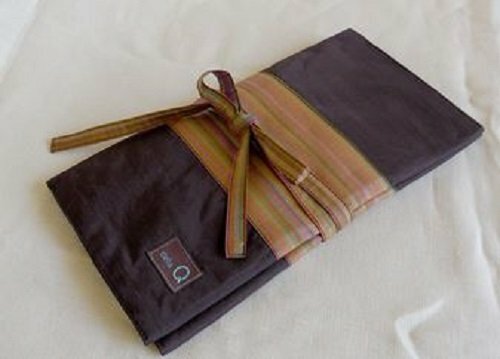 This wallet size case is perfect to store your Knit Picks, Addi Clicks or any other interchangeable set. It might even be smaller than your wallet for those of you who feel the need to keep every receipt. You have a case already? Where are you storing those extra tips we know you bought? There is space in this case. The case folds in quarters and ties securely. A zip pocket on the side stores your connectors or tools. Closed: 4" w x 7.25" h Open: 14.5" x 14.5"
View More In Needle Cases. If you have any questions about this product by DELLA, contact us by completing and submitting the form below. If you are looking for a specif part number, please include it with your message.